I have picked all the flowers off my pelargoniums and lifted the plants. In the past I have tried to dry them out and then repot in the Spring and planting out after frosts have finished – this had very limited success. For the past couple of years I have dug them up and kept them going inside all winter, then planted them out again – each time removing the blooms and taking cuttings. It seems to work and I get the bonus of flowers all winter. I feed them with a little Tomato feed each week. There is a bit of a Ta Dah! moment going gone in my sitting room at the moment. 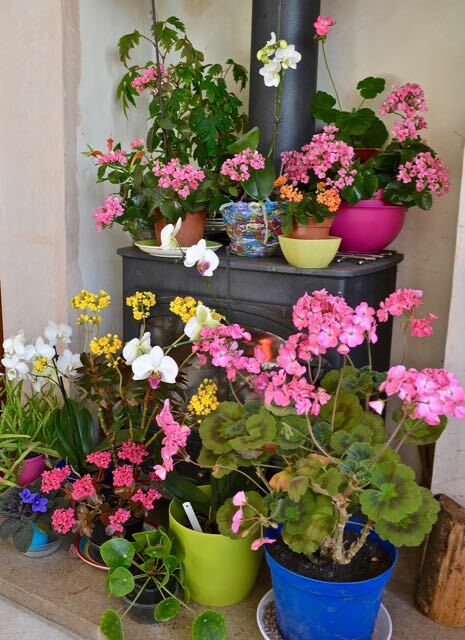 Although it is still pretty chilly outside, I don’t think I will be having any more fires and to celebrate I have gathered some of my flowering houseplants together on the wood-burner. Apart from the orchids, I have grown all of them from cuttings which is immensely satisfying. But it is the kalanchoes I’m particularly pleased with as they have not flowered for about 3-4 years and I was considering throwing them out when last November I noticed some buds forming – patience rewarded! And now they are really putting on a show!